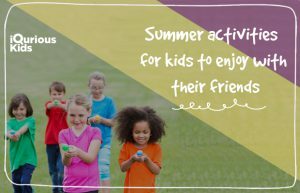 Summer Activities for kids to enjoy with their friends! As schools across the country close their doors this week, and kids are free for two months, parents look for activities through which their little ones can have endless fun. There are lots of great things about summer that cause us to welcome warm weather, barbecues and long days with open arms; But trust us, the best part is kids playing freely and learning a lot of new stuff. For bowling pins, get the empty plastic bottles lined up in your living room, garage area or wherever in the house, it seems feasible to you. Get lightweight plastic balls, and put two long broomsticks on both sides to mark the area and give your kids the alley feel. Keep tabs on the score and have fun! When you need to keep the kids active but it’s way too hot to play outside, string up a rope, net or your scarves tied together across your hallway. Now, do not hand them the balls, instead give them the balloons to play Volleyball with. Bored of Volleyball??? Well, you can always add a couple of rackets or paddle boards and it becomes balloon badminton! Voila!! This game will have everyone chuckling. Request your kids to sit on the floor around. Turn on a few tunes and have them pass the potato (a bean pack or delicate ball) around the hover as quick as possible. At the point when the music stops, the player holding the potato leaves the circle. Continue going until the point when just a single player is left and wins. So, this game will get your kids well acquainted with nature and can be played by kids of age between 5-12 years. Pick out some leaves from the garden area and put them in separate jars for your kids. Now send them to the garden and get them to pick the same leaves and then tell them the name of the plant or tree as well and as much more information as you think can absorb. This is so much fun, when a kids learn about the different shades of nature, starting from their very own garden areas. Kids love the colorful stuff. Give them a pack of marbles, canvas and painting colors of different shades. Now get the kids to coat the marbles in different colours and drop them in the box. They can use as few marbles as they want or as many, depending on the number of colours they want in their painting. Now close the lid and shake the box a few times. Open it and voila, the painting is ready! Reading is reading, whether it’s a novel or the side of a cereal box. Just make sure you approve of the content! Q: Is there anything better than spending a starlit Summer night with your family, chasing fireflies and eating s’mores? A: No. There isn’t. Enjoy the summer while you can with your little ones. These will be the memories which you will cherish forever as you watch them grow. Also, if you want to enroll them in the summer camps with iQuriousKids, then contact us.